Learn the keys to achieving workplace success and strengthening supervisory relationships! 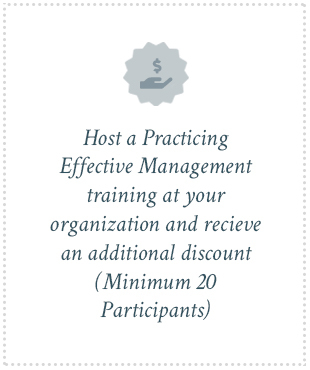 Practicing Effective Management provides managers with relevant guidelines and meaningful tools for workplace success. In this course, participants will understand the nuances of management vs. leadership, identify appropriate ways to support their direct reports through structured supervision, learn how to exercise effective time management, and effectively respond to the demands of the workplace. Through course materials and active teaching methods, participants are equipped with the information and tools needed to develop and maintain successful, strengths-based, professional relationships with their peers and direct reports while maintaining good boundaries between their job demands and personal life. Key aspects of this training are relevant to all levels and types of management, including clinicians, practice managers, shift or team leaders, supervisors, managers, executives, and health care professionals. This course approved for 12 Michigan CE hours for Social Workers.